Not everyone wants to reach the top of the world, but we all have our own Everest to climb in our lives. For example, having a successful business, reaching 1000 followers on Twitter (@okolodynska) or learning to play a sax. 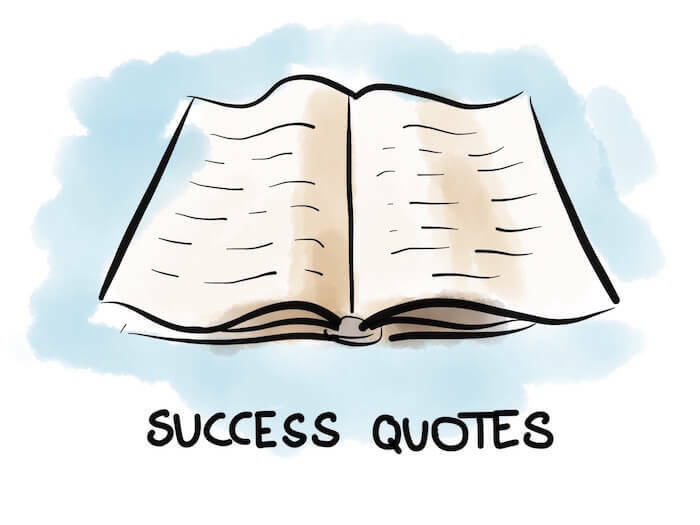 Here are a few success quotes that I hope will help you keep moving toward your goal. You’re not capable of satisfying everyone at the same time. Trying to do that is a waste of your time and energy. When you try to please everybody you can easily lose your inner voice. This way you won’t come up with anything creative. That’s because the true value in what you create comes from within. Not everyone will love what you do, but you will probably find a great amount of people who do. So focus on what you do best and keep developing. One thing is sure – you won’t achieve success just by sitting there and doing nothing. When you take an action you can fail, once, twice or even twenty times but it will only bring you closer to success. Even if it doesn’t look like it when you first lay down there, trying to get up. Success is always connected with taking action. People who are successful are not the ones who don’t make any mistakes. They are the ones who keep failing and getting up. Because the most important thing is not to quit trying. Unless you’re a well born kid with famous parents, opportunities won’t just come and knock on your door. You need to go out and look for them. You need to create them on your own. How? First of all, don’t be afraid of some big changes in your life or career. Changes are good and they help you grow. So don’t settle and keep looking for potential opportunities. It’s all in your hands. Success doesn’t just happen. It is based on small, everyday efforts. It requires constant work and care. Which means you need to be patient and consistent in order to achieve one. In the heat of work, sometimes it’s easy to forget all the small efforts you’ve done over the years. When it happens, it’s good to look from the distance into your life. You will see the long way you’ve come and appreciate every part of it. And then you can get back and patiently move forward, closer to your goal. You surely put a lot of work into achieving your goal. But when you finally succeed all that people see are results. Suddenly, something you worked on for years looks like an overnight success. But as you know, there’s no such thing! Success is never a coincidence. If you want people to be aware of it, let them be a part of your journey. The road to success is much more interesting and causes more emotions than the success itself. Tell people your story and they’ll appreciate what you’ve done. They won’t say you just got lucky. They will understand that somehow the harder you work, the luckier you get. It’s a really true quote. But to better explain it, I will change its time frames. I would say people overestimate what they can do in a day or a week but they definitely underestimate what they can do in a year. You always wanted to learn to play a sax, but turned out you need more than just a few lessons to play? In result, you gave up. But have you thought that with only 15 minutes practice a day, you will be able to play in few months? And you will be at least decent after a year? Sometimes we think we can rock the world in just one day but when we start to understand that the road to our goal is much longer, we give up. We tend to stop trying if we don’t see results right away. Well, we live in the world when we can get almost everything “here and now”. Why bother? But when it comes to success the rules are the same as they used to be. You need to be patient, consistent and work hard to move ahead. Step by step toward your goal.